As we near the end of Bite-Lite’s third full season as the exclusive distributor of the H-Trap Professional Horse Fly Control and Trap System in the United States, we would like to thank you for your purchases and your reviews of our horse fly traps. Our horse fly sales now extend to 48 states, adding 10 more this year alone. The reviews are indicative of how our one legged horse fly trap has performed while controlling and trapping tabanids (aka horse flies) without chemicals or electricity. The reviewers of our horse fly traps have run the gambit between trainers, homeowners, veterinarians, and boarding facilities. Since introducing the H-Trap to the U.S. market, we have nearly 1300 traps now dotting the countryside. Those states where our sales are the most brisk and are most inundated with horse flies, also known as greenheads, deer flies, B-52 bombers, and yellow flies, are: California, Colorado, Connecticut, Florida, Georgia, Illinois, Indiana, Kentucky, Louisiana, Massachusetts, Maryland, Maine, Michigan, Minnesota, Mississippi, Missouri, North Carolina, Nebraska, New Hampshire, New Jersey New York, Ohio, Oklahoma, Pennsylvania, South Carolina, Tennessee, Texas, and Virginia, and Washington. We received verification from a number of our horse fly trap reviewers that our traps are sturdy. Not surprisingly we heard that our traps were pricey on the one hand but professionally built on the other hand. The old adage, “You get what you pay for” is definitely true when you are buying a long lasting horse fly trap like Bite-Lite’s which will service your horse fly needs for years to come. Several reviewers mentioned that horse flies dropped dramatically in just a short period of time after installing their horse fly trap. One reviewer from South Carolina said she couldn’t believe it worked in just 12 hours after installation, and that she had already caught two dozen horse flies and deer flies in that period. We also heard that other buyers are having slower or little results. At Bite-Lite, we welcome all calls to help you assess whether there is an ideal trap location and if you even have horse flies. A horse fly trap owner from Ohio said it was worth the price even if her horse fly trap just worked for deer flies, because she was allergic to this species of horse flies. A horse trainer from Virginia said he absolutely loved our horse fly trap, and said it was a great product in catching horse flies and even gnats. He said he was happy because the horse fly traps helped reduce the amount of fly spray he used to use before installing the traps. A horse rider from England also noted the benefits after installing his H-Trap horse fly trap—no more fly sheets—and regretted he had not bought one sooner! Another reviewer of our horse fly trap from North Carolina said he was pleased because our horse fly trap did not catch the friendly bugs that are good for the environment. Instead he caught 40 smaller horse flies that he said almost rid his yard of all of the bad flies. 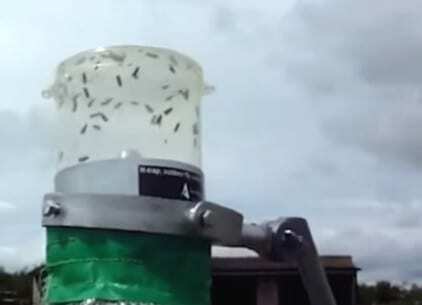 A reviewer of our horse fly trap who owns a boarding facility in Florida gave our trap a thumbs up compared to other traps he tried because it stands up to the elements, including wind and thunderstorms. He found the trap moved with the wind and the conical hood shed the wind and rain. We have heard from a number of you who have had success using our horse fly trap to protect loved ones in the vicinity of the swimming pool. Reviewers have said they can use their pools now “without getting eaten alive” and they “no longer are swimming with a fly swatter.” We have also learned that the heat absorbed from plastic slides may compete with the efficacy of the trap next to a pool, and have offered advice and techniques to discourage this situation. While our returns are few, we do have calls from buyers who tell us we have not met expectations. We want to hear from you, and do our best to scientifically analyze, with the help of our entomologist, the problem properties as well as the types of flies via photographs that we ask you to send to us. A few times, the horse fly trap has been bought for the wrong reason, i.e., to catch biting stable flies and horn flies, whose behaviors our traps are not designed to catch. Other times we have learned of problems when a buyer has a dark horse; we are finding that the heat of the horse may be far more attractive as a “lure” than the heated black ball. The research out there does suggest that lighter colored horses are less bothered by horse flies than dark colored horses. One of the solutions we have proposed is to use a white fly sheet on a dark colored horse. To read the complete reviews about our horse fly trap, visit our Reviews page.